The heart of George Clooney’s smart political drama The Ides of March, is the kind of thin idealism that pride and anger can easily butcher---the kind that can drive a young man to supreme competence, douse him in moral superiority, but not protect him from hurt and revenge. A Democrat’s run-up to the US primary elections in Ohio, projected as the crucial state for any candidate, and the dirt and betrayal that it unravels are a perfect backdrop for such an idealist’s journey. The Republican aide is up for the buying, scandals are ruthlessly hushed up and loyalty usurped. Clooney’s film is based on a play by Beau Willimon, and he co-writes the screenplay with Willimon and Grant Heslov. This isn’t the most nuanced political thriller. None of the characters’ battles or mental make-ups display strong political convictions like, say, in Z, Costa Gavras’s iconic thriller or Cold War political satires such as John Frankenheimer’s The Manchurian Candidate. The Ides of March is concerned with the game and its spin doctors, and the dangerous, predictable turns they unleash. Director Clooney’s protagonist is Stephen Meyers (Ryan Gosling). He is the rookie press aide who is convinced Mark Morris is the change America needs. A master strategist, who hero-worships his boss Paul Zara, Stephen’s charm and versatility attract an intern (Evan Rachel Wood), a canny journalist looking for scoops (Marissa Tomei) and overtures of the rival campaign manager. Tightly plotted, the narrative pace doesn’t ever flag, even though the writers’ style does not follow the breakneck template of most Hollywood thrillers. There’s a staid predictability to the film---you almost know who will eventually convert and who will win the invisible race for power within Morris’s camp. Some episodes, such as those involving an intern, are stuff of clichéd melodrama. Yet, The Ides of March has a nail-biting effect. Watching so many of Hollywood’s brightest share screen space induces a high. Scene after scene, I looked forward to how one actor will take off from where another left the story---it’s almost an irresistible marathon of acting face-offs in the garb of a film. George Clooney, Philip Seymour Hoffman, Paul Giamatti, Marissa Tomei and Hollywood’s current toast Ryan Gosling---the combined power of this cast is reason enough to watch this film. Gosling does justice to the plum lead; he carries off Stephen Meyers with panache without ever resorting to overacting. 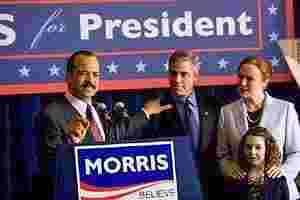 The Ides of March is one of the most exciting movies to have come out of Hollywood in recent times. Don’t miss it. The Ides of March released in theatres on Friday.